Major objective of this lecture is to present on Speed of Light and Refraction. At an interface between two media, both reflection and refraction can occur. 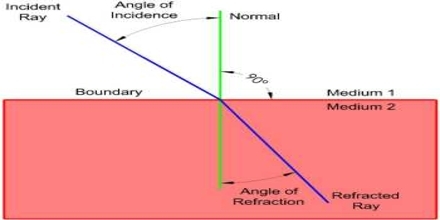 The angles of incidence, reflection and refraction are all measured with respect to the normal. The angles of incidence and reflection are always the same. Refraction is the bending of a wave when it enters a medium where its speed is different. The refraction of light when it passes from a fast medium to a slow medium bends the light ray toward the normal to the boundary between the two media.